Karlee Miller has to deal with the loss of a leg in addition to all of the other challenges that face teenage girls, but she tries to make the best of it. “But I got it for half price,” said Karlee with a smile and laugh. Karlee’s left leg was amputated well above the knee at the age of 5 as the result of cancer that first infected her muscles and then moved to the bone. She’s been cancer-free for the past 11 years, but a combination of her own inner determination and a Nike sponsorship has her sights set on a lofty goal: competing in swimming events at the 2020 Paralympic Games. Karlee discovered competitive swimming only few years back – and it wasn’t love at first lap. “After the first day, I didn’t want to do it anymore. My parents had me keep trying and, eventually, I learned to enjoy it,” Karlee said. She’d tried other sports from running to softball, but one call by a coach soured her on the idea of both of them. “The coach pulled me out of the game when I was on base because he wanted a faster runner,” Karlee said. She quit softball in the middle of the season because the decision stung so much. Karlee took up swimming about four years ago and began swimming competitively at 14. She had to figure out how to do it without the aid of prosthetic because, although there are models that are made for use in the water, the amputation left her with so little left of her leg that they were unusable for her. Competitive swimming led her to competing in open-water swims in Oregon’s Hagg Lake and in the open ocean off the beaches of San Diego where she’s completed lengths of one mile. In 2015, Karlee’s pursuits led her to connect with a mentor in fellow amputee-athlete Sarah Reinertsen and then one of Nike’s sports managers, Lori Roth. That led to another challenge. “One of them dared me to run the Nike Women’s Half-Marathon. At first, I kind of blew it off and then she came back and said I was locked in,” Karlee said. She began panicking as the date neared and the realization sunk in that it was 13.1 miles through one of the hilliest urban terrains in the country. “The night before it was all deep breaths,” Karlee said. “When I finished, Lori was shocked. I ended up being the youngest female amputee to finish that race.” Karlee still wears the pendant she received for finishing the challenge on a regular basis. Not long after the half marathon, Karlee learned that Nike wanted to sponsor her. That news led her father, Steven, to put out a call on Facebook that a trainer was needed. Keizer’s Carlos Soto, owner of CS Defining Fitness, was tagged by another former client in the post and he offered his services. For the past year, the two have been training together and with Soto’s other clients in his River Road gym. But, it’s been a learning experience for Soto as well as Karlee. The first time the pair got together, Steven accompanied them to McNary’s track so Soto could see her in action. Karlee said there is a mental hurdle to running that those with two legs would struggle to understand. “I will swing my leg out when I’m not paying attention. It should go up and under more like a traditional runner but, in my head, I’m always thinking my toe will get stuck and I’ll trip and fall,” Karlee said. Karlee has some load limits as far as what she is able to bear, but Soto has been able to adapt most of his exercises for her needs. “She favors the amputation, but we are trying to get her hip flexor straight and it has improved a lot in the past year,” Soto said. To assist in his ability to work with Karlee’s needs and desire to compete in the Paralympic Games, Soto has taken part in camps on the Nike campus tailored for amputees. Along the way, Karlee rarely fails to impress. The first time Soto brought out a jump rope, Karlee left him agape. He took out his phone and started filming so others could see what she was capable of. He was also surprised to discover that her favorite workout music was rock from the 1970s. Soto said he puts more thought into movement than many of his clients would guess, but working with Karlee has been a wholly new experience. 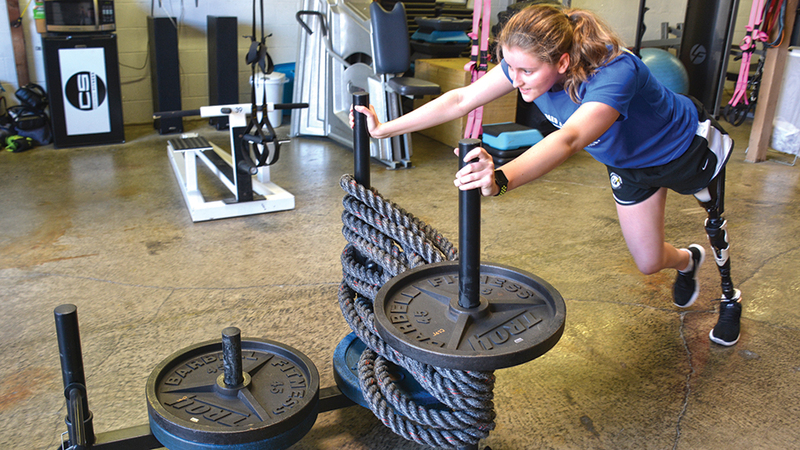 “I try to go over it and think about the mechanics of a knee and the exercises she will be able to do, but there are still times when we need to modify something on the day we try it,” Soto said. For her part, kettle bell swings are the least favorite of the rigors Soto puts her through, but he rarely hears her complain about anything. “She’s an inspiration with the drive she has. Most of my clients know her because I invite her to different group trainings and they watch her and get more motivated,” Soto said. The immediate goal is the Paralympics, but she’s happy to have developed the relationship she has with Soto, especially since that other coach left such a welt on her pride. Gloria Murphy passed away in Coats, North Carolina on June 19, 2018. She was 65. Arrangements are by Cremation Society of the Carolinas. Marian L. Franken passed away peacefully in her sleep at age 88 on June 11, 2018. Her family was at her side. Marian was born March 21, 1930 in rural Brown County, Nebraska.The Great Depression was just beginning. Her mother Edith died unexpectedly when Marian was just four. Marians father remarried two years later and she became one of six in a blended family, living in the Sandhills of Nebraska. After graduating high school in 1948 she got her teaching certificate and taught in a one room schoolhouse. Marian, ready for a change ,set out for Omaha. She lived at the YWCA and worked for Mutal of Omaha. Marian met Francis, the love of her life ,and they married June 11, 1955. The new couple moved to Bellevue where their three daughters were born. Marian was an excellent homemaker and cook. She sewed, painted, wallpapered, knit, and canned and cooked all the goods from the garden. In 1974 Frank retired and the family moved to Corvallis, Oregon. After the girls graduated and moved, the couple moved to West Salem.They were married for 38 years when Frank died in1993. Marian sold her house, moved to Keizer where she had her dream house built. She resided there for the next 30 years. Marian traveled to Italy, Ireland, New Zealand, Australia, and Switzerland. Marian enjoyed her friends her rose garden and her family and bridge. She moved to Portland the last few years to be close to her kids. Marian is survived by her sister Vernice of Iowa and daughters Barbara Moore of Bend Oregon, Julie Warren of Goldendale Washington and Leslie Maynard of Oregon City and grandsons Matthew and Jason of Tempe Arizona. She will be laid to rest at Willamette National Cemetary with Frank. A small service will be held at a later date. I don’t understand discrimination, racism or prejudice. I know what the words mean, it’s just that I can’t wrap my head around the people who harbor such views. As human beings we all have our biases, we generally are uncomfortable with things that are different or unknown to us. It is tragic that people are subjected to verbal threats, taunts and physical harm. Where does hate for another person come from? We certainly are not born with hate in our hearts and minds, so it must come from the environment. Children copy what they see either at home or in public. If a child sees that a negative behavior has no consequences the only conclusion for that child is that it is alright to call someone by a slur or threaten harm. These days some misguided people are letting law enforcement do their discriminating. It is beyond the pale to think that a white person would call 9-1-1 to report a black person doing what people do all the time: barbecuing in a park, waiting for a friend at a restaurant, taking a nap in a public library or even selling water in front of their home. It is troubling when people who call the police in such situations don’t express remorse or say they were wrong for calling law enforcement.Some jurisdictions have laws against frivously calling a 9-1-1 service. What could be more frivolous that calling the police on a little girl selling water in from of her own home to fund a trip to Disneyland? Pundits write that people are worried that their ‘way of life’ is ebbing away as minority populations grow in this country. Remember that “I want my country back” was a rallying cry during the 2016 presidential campaign. That sentiment hurts my sensibilities. America used to proudly boast that the United States was a great melting pot of people from all corners of the globe. This country has always had a tough stance against all immigrants. The Irish were not welcomed with open arms, nor the Italians. Asians, especially Chinese, were dealt a particularly harsh hand in the 19th century, even excluded by Congress and the courts. It is not much different today for people arriving from our neighbors to the south or from the Middle East or Africa. Do bad people get into the United States? Sure, as it has always been. That doesn’t justify hating a whole people due to the actions of a small percentage. Diversity and inclusion is good for anything—countries, companies, communities. I spent this past weekend in Seattle. It was Pride Weekend and tens of thousands of people of different colors, genders, sexual orientations and ages mixed effortlessly on the streets of the city, including the four-hour pride parade downtown. No city, regardless of how big or small, is immune from acts of racism and discrimination.So it was wonderful to spend a weekend in the big city where a rainbow of people mix together, all sharing a message of inclusion, acceptance and tolerance. It is harder to be frightened or wary of someone who is different if you know them. There was a shared energy on the tightly packed sidewalks during the parade because they all shared a message—everyone is important. People who are different from us are not dangerous, they are not out to harm us; we all want the same thing: to live in peace for ourselves and our families. Anyone will reciprocate in kind when treated with respect and fairness. My way of life is not threatened because a Sikh wears a turban or a Saudi-born woman wears a burqa. I have learned from living in other areas that diversity is important, my life is richer because I have known and befriended those different than myself. How? I have gained respect for traditions and customs other than my own. I have learned that things I take for granted are not always good for others. Social change begins with each of us. We can lessen discrimination, racism and sexism in our society by remembering that our kids mirror what we do. Accept others with respect and tolerance and our future generations will too. Recently, there have been multiple newspaper articles sounding the alarm that Oregon’s vaccine exemption rate for kindergarten students has sharply risen. Is this true, or is there more to the data than people understand? The truth is that 22 vaccines are required for school. Someone receiving 21 of 22 shots, is still captured by the Oregon Health Authority (OHA) as exempt. “Exempt” quickly morphs to “unvaccinated” in the press, and the public’s mind. According to the OHA Immunization Program, for 2018, the numbrer of K-12 students with a non-medical exemption to all 22 required vaccines is only 2.6 percent. But that is not the number that is reported anywhere. Many legislators misstate that Oregon’s unvaccinated rate is 7.5 percent. This is simply untrue. In a 2018 memo to the Governor, OHA stated, “The vast majority of Oregon parents choose to fully immunize their children.” According to the memo, the uptake for every school vaccine is well over 90 percent. Why did OHA then issue a press release with the foreboding title of sharply increasing exemption rates, picked up by newspapers statewide? Is it to pave the way for an attempt in 2019 to remove Oregonians’ medical freedom, under the guise of an emergency? It’s June and the crush of undocumented immigrants at the U.S. border with Mexico has hit a crisis point. The year was 2014. Barack Obama was president and the quote was uttered by Hillary Clinton, Obama’s secretary of state from 2009 to 2013 who also plainly stated that thousands of children “should be sent back” to their families. So why are news outlets treating the 2018 border crisis as if it is the worst? First, President Donald Trump is the first president in recent memory to push strong enforcement of federal immigration law. His “zero-tolerance” policy announced in April directed immigration officials to charge and detain all undocumented immigrants apprehended at the border, which led to mass family separations. The Obama administration split families and housed migrants in tents, but it also released many apprehended at the border while giving them orders to appear before an immigration judge. This is the system Trump derides as “catch and release” — a system discredited by the high number of beneficiaries who don’t show up at court. According to federal statistics, 25 percent of the 186,434 immigration cases completed for 2016 were decided in absentia — meaning the undocumented immigrant didn’t show up. Second, Trump’s rhetoric is inflammatory and words have consequences. Trump didn’t enhance his credibility when he blamed Democrats for forcing family separations, trying to paper over the fact that “zero tolerance” was his administration’s decision. Also, the point of the family separation is to deter more families from making the dangerous trek to the border — but that’s the point Trump low balls. Third, politics and media bias lean against enforcement. Broadcast news outlets have aired heart-breaking scenes of children crying for their parents — with no context. News organizations ran photos of a crying two-year-old Honduran girl who represented victims of family separation. Problem: She and her mother were not separated. Do the parents have a legal claim to asylum? Not an issue. Also not an issue, the fact that critics are complaining that Trump is enforcing federal laws they have failed to change. Consider the push for a path to citizenship for undocumented immigrants brought into the country when they were minors, also known as Dreamers. Obama provided them with temporary legal status with his Deferred Action for Childhood Arrivals in 2012. But Obama failed to keep his 2008 campaign promise to pass a big immigration bill in his first year, when Democrats controlled the White House and Congress. When there was a vote on the Dream Act in 2010, it failed to get the 60 votes needed to pass in the Senate. Democrats now say they won’t vote for GOP legislation to protect DACA recipients because they object to Republicans using DACA recipients as hostages. It’s as if they’d rather have the issue than the win. Generalizations about us don’t always apply to all humans. However, it’s generally recognized and agreed upon that a human body can go two to three days without water and 30 to 40 days without food of any kind. Water is clearly the most important requirement with an average of eight to ten cups of water needed to replenish what the human body loses each day. Unfortunately, water supplies all over the world are more and more often polluted and thereby a danger to health and a threat to life itself. Western Oregon has been often recognized, due to the state’s forested regions, mountain ranges and dependable and sufficient annual rainfall, as one of those places on the planet whose water supply would remain healthy and drinkable even if the remainder of humankind had to heavily filter the water or desalinate it. That may remain true for places outside of Portland and Salem but not now in Oregon’s “Rose” and “Capital” cities. Locally, it could cost millions to make Salem’s water potable again. However, some argue that long-term, less costly and much more practical solutions to consider must include phasing out industrial tree plantations that work by clearcutting, chemicals and fertilizers. Industrial logging practices are one of several underlying causes of the toxic blue-green algae (cyanobacteria) outbreak contaminating Detroit Reservoir and North Santiam River. Coupled with climate change, latter day practices destroy otherwise perfect drinking water conditions. Common knowledge on the subject comes to us from science. Toxic algal blooms thrive in warm, slow moving water contaminated by nutrients and chemicals that assist in their growth. Then, too, clearcut watersheds lose their soil moisture and provide less water during periods of low rainfall while any streams run slower and warmer—often by 2.6 degrees—than in those under normal full-forested conditions. These conditions have been studied and it has been proven that heavily logged watersheds have at least 50 percent or less water in them during dry and drought durations. Thus, algae thrive in nearby lakes and streams. Another cause for algae come from chemicals and fertilizers liberally used on tree-growing plantations. Applications of herbicides and atrazine always find their way in rivers and lakes. The use of them in Lake Erie brought Toledo, Ohio, to near closure four years ago. Nitrogen fertilizers like urea are most common used in Oregon and are recognized as a chief culprit in turning wonderful watershed water into something that looks awful, tastes awful and can send a person to the hospital and an early grave. By this point here, the reader must recognize the obvious: The solution is to stop the application of chemicals and fertilizers and industrial scale clearcutting to any area where Oregonians now or later get their drinking water. Timber plantations must be controlled and monitored for compliance with Oregon laws made to address this very serious challenge to our health and safety. The matter is even more urgent at present than at any earlier time in Oregon as climate change is a fact, bringing ever drier conditions in a new, no longer deniable, world we humans have inherited. Arguably speaking, there probably are some things, perhaps a modern gadget or two, we Oregonians can live without. However, I would argue that clean-tasting, uncontaminated, drinkable, disease-free water is not among those items we can do without. Therefore, it would seem high time that those Oregonians who want to protect drinkable water would let Governor Kate Brown and our legislators (state and federal) know how important it is to them. After all, for the sake of human survivability on planet Earth, this matter falls into the life or death category. 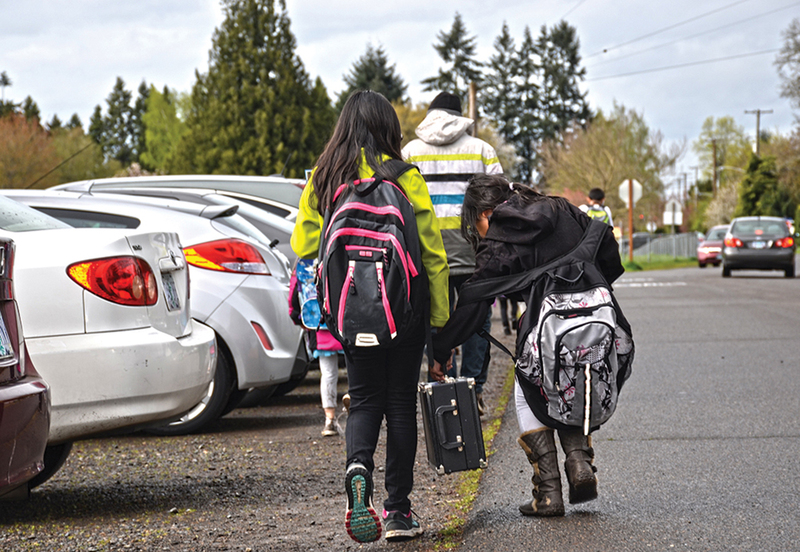 Members of the Keizer Traffic Safety, Bikeways and Pedestrian Committee are shifting into overdrive as they hone in on two potential projects to submit for state funding. The group met Thursday, June 14, and continued discussions regarding what improvement projects in Keizer would be the best contenders for funds being made available through a transportation package approved by the Oregon Legislature in 2017. At the recommendation of Mike Jaffe, transportation program director for the Mid-Willamette Valley Council of Governments, the committee settled on one project with a smaller price tag and one that will require a more substantial investment. Sidewalk improvements to Delight Street Northeast around Cummings Elementary School was deemed to be the most pressing concern with sidewalk access enhancements to the area around Kennedy Elementary School taking the No. 2 spot with a higher price tag. “We need to hammer out specific streets and whether we want sidewalks on one side or both,” said David Dempster, a committee member. Subgroups of the committee planned walkthroughs of each area last week to discuss specifics. The decision appeared to put to rest a months-long conversation regarding which of the two projects would get the full support of the committee. However, it was made easier this time around with input from Jaffe, who had the latest draft rules for the competitive funding process on-hand. The rule-making committee is favoring projects within a mile of Title 1, K-8 schools. Cummings and Kennedy are both designated as Title 1, which denotes schools with high percentages of children from low-income families. Jaffe also encouraged members of the committee and someone from city staff to attend a transportation workshop in Salem as part of their preparation for submitting projects. One question still outstanding where money to match the state grants will come from. Depending on the final rules, Keizer might be able to cite an upcoming investment from the Salem-Keizer School District into the Cummings area as matching money. The recently-approved school bond measure includes a sidewalk build-out to the edges of the Cummings’ campus and may qualify as a matching investment without the city dipping into its own reserves. After determining the specifics for each project, the committee will need approval from the city council to move forward. Gregory Santos wanted to be an outfielder because he liked to hit. But at age 11, Santos began proving he belonged on the mound. At 16, Santos, with his 90-plus mile per hour fastball, caught the eye of a Boston Red Sox scout. He signed with the organization on Aug. 28, 2015 for $275,000. With his newfound wealth, Santos bought his family a home in the Dominican Republic and opened a grocery store for his parents. Santos grew up in San Cristóbal, the birthplace of former Major League Baseball players Raúl Mondesí and José Guillén. Pitching for the Red Sox Dominican Summer League team in 2016, Santos went 3-3 with a 4.17 ERA over 41 innings. Watching his teammates get called up to the United States, Santos was determined to improve in 2017. Santos was 2-0 with a 0.89 ERA over 30 innings when he was traded to the San Francisco Giants on July 26 as part of deal for major leaguer Eduardo Nunez. Pitching for the Giants Dominican Republic affiliate, Santos continued to thrive, posting a 1.93 ERA in four starts. 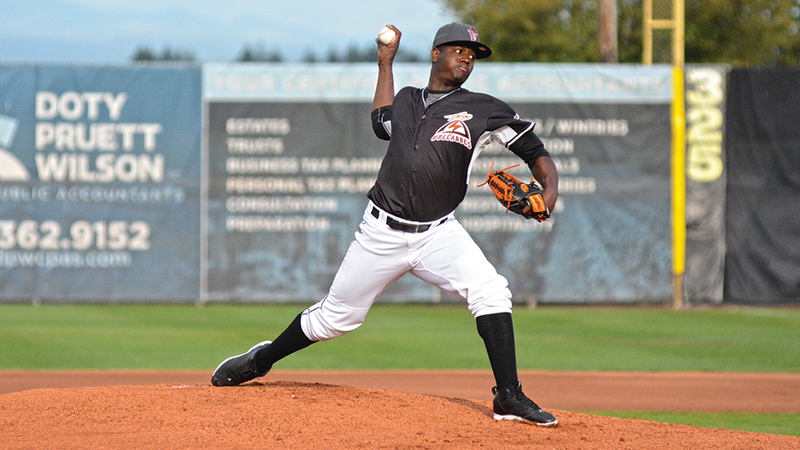 At 18, Santos made his United States debut with the Salem-Keizer Volcanoes on Saturday, June 16, striking out two of the first three Tri-City batters. After retiring the first six hitters, Santos allowed two runs in the top of the third inning on a walk, error and wild pitch. He then allowed his first hit in the fourth and was pulled with no outs in the fifth after giving up a two-run homer. Santos earned his first win on Thursday, June 21 at Boise. He allowed three hits, no runs and struck out five batters over five innings. Santos improved to 2-0 on Tuesday, June 27, allowing three runs over six innings in a 10-5 win over Eugene. Through three starts, Santos has struck out 14 batters in 15 innings and posted a 3.00 ERA. With his fastball reaching 97 miles per hour and an improving curveball and changeup, Santos has climbed up to 13th in MLB’s San Francisco Giants top prospect list. 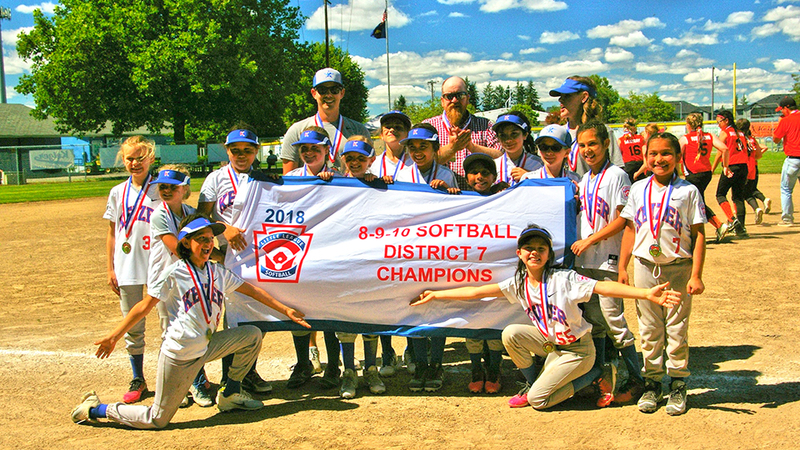 For the first time in almost two decades, the Keizer Little League All-Stars (8-9-10 Division) softball team is heading to the Little League state tournament. The All-Stars defeated Dallas twice at Keizer Little League Park Saturday, June 23, to win the state berth. In the first game, the Keizer team won 18-11 in six innings. The second time around, Keizer pulled out a 12-2 win in four innings. Keizer scored eights runs in the first inning of both games. At the plate, Marlina Martinez was 2-for-3 and scored three runs in the first game. She also pitched the first three innings, allowing two hits and one earned run while recording seven strikeouts. Madelyn Sponable, who scored four runs, finished off Dallas in the circle. Pacia Winter scored two runs. Courtney Corron and Isabella Harding each had two RBIs. Martinez and Sponable again combined to defeat Dallas in game two. Sponable pitched the first three innings and Martinez got the final three outs. Batting leadoff, Sponable scored three runs and drove in two. Natilee Corron scored two runs in the rout. Coach Nate McClenny said it was the first time in 19 years that the 8-9-10 division team has made it to the state tournament. The state tournament will be held in Medford July 18-21. Players are: Jeily Ramirez-Sierra, Ellie McClenny, Madelyn Sponable, Carmen Thomas, Jordyn Cortez, Makiya Page, Isabella Harding, Annabelle Davis, Marlina Martinez, Pacia Winter, Shayla Mendoza, Courtney Corron, Baylie Imig and Natalie Corron. Assistant coaches are Calli Sponable and Zac Thompson.